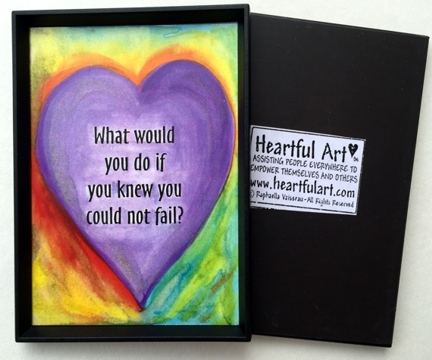 A 2x3 colorful heart magnet by Raphaella Vaisseau which poses the question, "WHAT WOULD YOU DO If You Knew You Could Not Fail?" This magnet is meant to inspire us all to action and envision possibility! Raphaella first saw the quote, "What would you do if you knew you could not fail?" many years ago on Oprah Winfrey's website. Right away, she wrote to Oprah for permission to use it. She was referred instead to author Cheryl Richardson, who gave Raphaella permission to create art around her inspiring words. Cheryl preferred the words stand alone as a question to ponder, rather than have her name printed below them. Raphaella painted a beautiful heart around the quote in purples and blues and reds and yellows, made it into a magnet, and placed it out for sale at her gallery in Sausalito, California. A woman bought it soon after that and said to Raphaella, "I need fifty more by Friday!" She explained she was flying to the Middle East in a few days and was giving a workshop on peace to fifty women there. Raphaella made them for her, shipped them overnight to Miami in time for her flight, and off they went. After the peace workshop was completed, the woman gifted this magnet to each of 25 Israeli women and 25 Arabic women who were in attendance. Stepping into what's possible gives us a fresh reference point for what our passions and desires truly are. Allow yourself this daily inspiration to be the best that you can be. Dream a little. Believe in yourself. One person can make a difference.